The Art Workers’ Coalition (AWC) was formed in New York in 1969 in the wake of an incident in a museum. The Museum of Modern Art, New York (MoMA), mounted an exhibition titled The Machine as Seen at the End of the Mechanical Age. Within the exhibition was a work by the artist Vassilakis Takis. Claiming that the museum had never asked his permission to exhibit his Tele-sculpture (1960), Takis disabled the work and removed it from the gallery (but not, it seems, from the museum). Later, Takis distributed a flyer that alerted the New York art world that this would be “the first in a series of acts against the stagnant policies of art museums all over the world.” Following on from the spirit of the student-worker uprisings of May 1968 in Paris, Takis exhorted artists to unite with “scientists, students with workers, to change these anachronistic situations into information centres for all artistic activities” (quoted on 13). 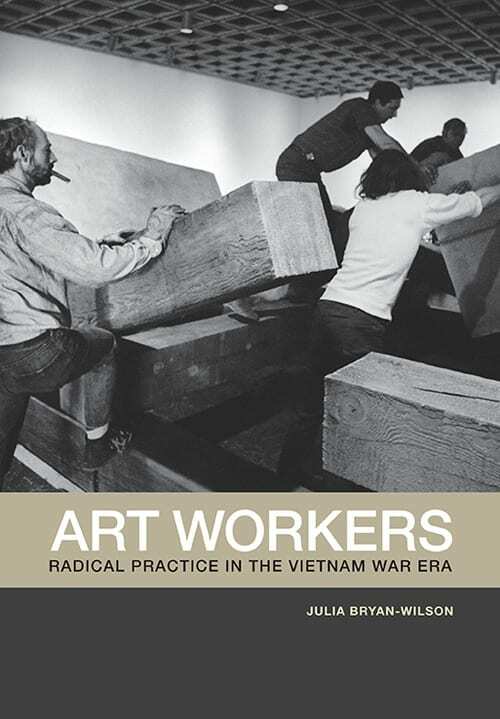 As Julia Bryan-Wilson notes in her opening case study in Art Workers: Radical Practice in the Vietnam War Era, on the theme of artist as worker, “The statement calls for cross-class solidarity as it envisions revitalizing the institutional spaces of art viewing” (13). If Takis’s intention was, as Bryan-Wilson claims, to subject the museum to scrutiny, he was in good historical company. The appeal aimed at artists to modernize museums—to bring them into line with the most contemporary art practices of the day—had been a constant refrain in New York since the 1940s. The American Abstract Artists (AAA) group picketed MoMA in 1940 and issued a pamphlet—designed by Ad Reinhardt and authored largely by Harry Holtzman—that questioned the currency of the museum’s exhibition policies. Later that year, the AAA circulated another polemic that subjected to intense criticism a number of well-known New York art critics, all of whom had displayed little sympathy for contemporary abstract painting by New York artists. The game of opposition to the institutions of art is, after all, part and parcel of the self-conscious process of legitimizing an avant-garde. That this strategy intensified during the latter half of the twentieth century, as artists became more aware of the power of the media, is perhaps beyond dispute. Yet while there is no doubt of Takis’s sincerity in his campaign, we may pause to consider its political form and its impact on how artists of the late 1960s would begin to revalue and revise their praxis. Bryan-Wilson’s argument, briefly put, is that the redescription of artists as “art workers” represents a significant transformation, both aesthetically and socially. While the AWC was one among several coalitions of the late 1960s and early 1970s devoted to advancing “artists’ rights, antiwar organizing, and struggles against racism and sexism,” the claim is that the AWC “critically transformed the meaning of art work in the late 1960s and early 1970s” (13). To the extent that Bryan-Wilson acknowledges an “intractable conflict” in the term “art worker”—a contradiction that manifested itself in an increasing, rather than decreasing, separation between art and labor—I think we are justified to consider how seriously politics, especially as refracted through class, was taken by the artists and critics who are the core subjects of the book’s account of the AWC and the case studies of Carl Andre, Robert Morris, Lucy Lippard, and Hans Haacke. The AWC—“a provisional coalition of disparate individuals”—quickly set about cataloguing its members’ concerns over the lack of control by artists of much that comprised contemporary art’s conditions of production and circulation (14). In terms familiar to the Left, this inventory of complaints vividly depicted the landscape of alienation as experienced by artists as producers. I hesitate to say “workers” because identifying with the working class is not the same as forging actual class ties with workers. While this should be obvious to anyone who has engaged with mass political organizations, it is not often easy to ascertain if Bryan-Wilson believes that the assertion of solidarity with the working class is a feasible prelude to actual class solidarity or an end in itself. In my view, Bryan-Wilson too quickly assents to the interpretations offered by her subjects and confuses pleas for institutional and art-market reform with substantive political change. Granted, any evidence of artists organizing to defend their rights or to reform the institutions of art is worthy of our support. The disenfranchisement of artists of color and of women artists, for example, has been a significant instance of injustice in the art world. But we should seek clarity about whether a plea for local adjustments to what is essentially a capitalist market in art has much to do with political change on the level evoked by the term “art worker.” It is self-evident that the activity of artists shares some features with a generalized conception of work, particularly when “creativity” is increasingly hijacked by corporations and paraded as an important attribute of corporate citizenship. The phrase “art worker” is an aspirational, rather than adequate, description of the actual class location of artists. Bryan-Wilson seems to agree with this position but does not really explain why this may be case, or supply us with an alternative formulation. Lee Lozano was clearly on to something when she exclaimed at an AWC meeting, “I will not call myself an art worker but rather an art dreamer and I will participate only in a total revolution simultaneously personal and public” (quoted on 17). This echoes the irascibility of the nineteenth-century anarchist Mikhail Bakunin, who proclaimed in 1868, “I shall continue to be an impossible person so long as those who are now possible remain possible.”1 But it also raises the thorny question of how the personal (one’s artistic practice) and the public (one’s political activism or urge toward social reform) intersect and inaugurate the lengthy and messy practice of political change. Bryan-Wilson opposes “art dreamer” to “art worker” as though the latter were somehow more real and more generative of collective political action than Lozano’s possibly unfortunate, romantic neologism. For some artists, the term “art worker” functioned as a kind of fetish that did initiate reflection on the relation between art and power. But can one really call such posturing politicization? Both constructions are idealist, but at least Lozano admits to the possibility of a collision of worlds. The problem may not be with art, but with culture: with our social experience as artists embedded in society, with our lack of power, and with our inability to learn from each other. Bryan-Wilson seems to grasp this, as evidenced by her stunningly sustained discussion of the career of Robert Morris. Her suggestion that by the time of the collapse of the Art Strike after the high point of May, 1970, the nature of the identity of art worker was “fractured” and “unsettled” is for me precisely the point, although I wish she had made it more forcefully (125). When it comes to Morris, I recall one of my professors saying, “Bob is always a little bit ahead or a little bit behind.” The outcome of Morris’s opportunism seems to have undercut the notion of art worker. One might say with some assurance that Morris demonstrated the poverty of the argument that a changed relationship between an individual artist and the work she or he makes has the potential to transform social relations between artists and others. That was 1970, yet some artists continue to search for the philosopher’s stone in the “new art–new world” playroom. If artists address alienation as a political rather than a psychological problem, might the actual conditions of the production of work change? Is the politicization of art merely about a more efficient use of art as a medium for talking about politics without ever actually being in politics? While art work in theory is treated as public and social—here I refer to Bryan-Wilson’s approval of Carole Pateman’s definition of work as “not just the activity that provides for most people the major determinant of their status in the world . . . [but] activities that are carried on in co-operation with others, that are ‘public’” (quoted on 32)—it remains the case that while artistic practice is necessarily collective, it is only contingently political. The hope for a new artistic identity remains just that, if it does not include critical scrutiny of the work produced (practice) and the means with which practice and the world entwine. To those of us who wrestled with such questions during the 1970s, in the aftermath of the collapse of the AWC, these remain crucial points of reference. Bryan-Wilson’s case studies of Andre, Morris, and Haacke bear out Ramsden’s assessment of the deficiencies of the AWC. The ontological inconvenience of some of the works of the three artists seemed at the time to cause stress to the institutions within which they were sited. Certainly, the cancellation of Haacke’s 1971 exhibition at the Guggenheim Museum on account of his notorious Shapolsky et al. Manhattan Real Estate Holdings, a Real-Time Social System, as of May 1, 1971 is something like a founding myth of political art for some. Regardless of the furore caused by Thomas Messer’s misguided censorship of Haacke on the basis of the work’s lack of “finish,” the separation of ethics from aesthetics guarantees that the artist remains professional, which in Ramsden’s view means “possessing a positive-technical privileged concept of ‘work.’”8 I believe this is true even though, as Bryan-Wilson notes, Haacke’s work bore no trace of “traditional” artistic labor. The model of artistic practice that is at issue here does not address the nature of the relation between artist and the public. Haacke’s practice of the time positioned the artist as an efficient manager of information deemed political. From Ramsden’s point of view, the ethical question involves a sharper political understanding of the dialogical relation between artist and spectator; it is a relation that must be constructed rather than assumed, because to take this relation as natural—and to simply present new wine in old bottles—is to misunderstand the matrix of cultural consumption in late capitalism. The crucial issue of “deskilling” is also raised here, and Bryan-Wilson rightly talks about the “reskilling” of the artist. The locus classicus for this discussion in art may be found in Ian Burn’s reflection on Conceptual art, “The 1960s: Crisis and Aftermath.” For Burn, the insidiousness of the deskilling of the practice of art “means a rupture within an historical body of knowledge—in other words, a dehistoricisation of the practice of art.”9 Bryan-Wilson does not raise this question in connection with Haacke’s work, nor is Burn even cited on this account. Bryan-Wilson’s discussion of Haacke’s work as an “excess” that resists immediate apprehension by the viewer is little more than a restatement of the (by now) commonplace that Conceptual art, in replacing the art object with a text, forces the viewer to become a reader in the most uncomfortable of situations. Whatever “rupture” Haacke’s 1971 project may have signified is quickly naturalized. Granted, Haacke’s work demonstrates a great deal of research, but the potential shudder it provokes as a piece of amateur muckraking is quickly dissipated by Bryan-Wilson’s claim that Shapolsky et al . . . represents a new skill set “at the level of the artist’s production” (206). To take power seriously is to commit oneself to social conflict. Hundreds of thousands of people on the streets of New York, one million people on the streets of London, hundreds of thousands elsewhere during the February 2003 protests against the threat of a second Gulf War did not stay the hand of the imperial power of the United States and her allies. The political edge of a collective of artists producing work and evading the market did not turn out to be a solution to the social and cultural contradictions gleaned by artists of the 1960s and 1970s. But it was part of the story and one that tends to be reified as “collectivity.” Class solidarity, like “audience,” can be a manic, rational power-construct or the ground for mutual exchange or encounter. For artists like Andre, Morris, and even Haacke, artistic practice speaks for no one in particular; rather, we hear the voice of the “art worker,” or the vox populi of the public sphere. The artist addresses an audience; the audience responds to the spectacle. It would be more appropriate to say that the term “art worker” has little to do with the concept of class as an analytic category describing the relations of social groups within capitalism to the means of production and more to do with a desire to transfer the “status” of the worker onto that of the artist. A bit of rough, if you will; the supermodel photographed against the backdrop of the crumbling inner city. Following Jon Elster, a more robust definition of class is required: “Classes should be defined by what people (in some sense) have to do, not by what they actually do. . . . A self-proletarianized student does not become a member of the working class if the option of becoming self-employed remains open.” Pointing out that such constraints on the definition of class are crucial and have real consequences in terms of social conflict, Elster continues, “We would not expect the agents who have to work or to sell their labor-power to align themselves with non-compulsory workers or sellers of labor-power.”11 The student-worker alliance of May 1968 imagined that good intentions would win out. Closer to home, coalitions focused on single issues evade the problem of class solidarity by assuming common interests that transcend class. We are all concerned about the wildlife of the Louisiana coastline in the aftermath of the Deepwater Horizon disaster, but shrimpers want to get back to work, and fast. There should be more theoretical bite in Bryan-Wilson’s book and more interest in an analysis of the politics of the AWC. Here I would question the fundamental form of the book. The case-study approach—a methodology borrowed from the social sciences—has the effect in this instance of fragmenting the subject and setting up barriers that make it less likely that one would notice the analytical tools that were historically present on the ground. The individual artists and the critic Lippard are treated as individuals enmeshed in the network of the New York art world and who define themselves in terms of that milieu as if figure against ground. Mostly, Bryan-Wilson is justly cautious about the extra-aesthetic claims made by her artist and critic correspondents; their “working-class fantasies” (213). This is where research pays off and helps to create a vivid picture of the AWC as an organization that provided these and other artists and critics with a sociality that motivated them to interrogate their personal work. But, as Bryan-Wilson points out, critical reflection on artistic or authorial practice could only take place at some remove from the sociality of the AWC. While this glaring disconnect was a powerful determinant of the practices of Andre, Morris, and Haacke in the 1960s and early 1970s, it was also responsible, in part, for the stunning failure of any of this work to produce anything more radical than institutional critique (213). At this juncture, it would be unwise to seek a resolution to the paradoxical social relations that constitute the reality of the petite bourgeoisie. I am not altogether unhappy about depicting the art world as a place of unresolved confusions. Such confusions may be heuristic and ultimately fruitful, but only if they are allowed to flourish. When “intractable conflicts” begin to crystallize into defensible aesthetic positions or self-aggrandizement—when, for example, aesthetic positions are taken as more than tropes of the political—we begin to sense a whiff of academia and the overvaluation of the symbolic status of art. This is a block against real social transformation—conservative to the core. Art Workers—an ambitious and detailed historical account of some of the paradoxes that serve to define the petite-bourgeoisie class identity of artists of the late-1960s—generally tackles the political self-identification of artists with aplomb, even if the book seems at times more like an anthropological study rather than what it set out to be, namely, a penetrating critical reflection on some art of the late 1960s. Bryan-Wilson’s book is significant owing to its level of historical detail; yet I cannot help feeling that this valuable material is not always put to its best use. In short, I would have welcomed less description and more trenchant analysis. One wishes to support the efforts by artists to improve their tenuous economic conditions and to wrest more control over art from those who manage it professionally. It is just that such efforts, while laudable and necessary, continue to confuse cultural form with political form. By this I mean to say that the conversations about art and society begun during the 1960s remain incomplete so long as the question of power is evaded. Our professional investment in art drives our enthusiasm to embrace art as a practice to which one can assign a precise social meaning. We are distracted from grasping art as a multivalent cultural phenomenon that conducts many conflicting cultural meanings, some of which are profoundly reactionary and bear no relation to the agenda of the socially engaged contemporary artist. If there is a feasible link between the inventive artistic practices of the 1960s studied by Bryan-Wilson and those that are newly emerging, it is that both sets of practices bear the mark of the collision of politics and art. As fleeting and incomplete as these artistic practices might be, they still seem to have the potential to capture the imagination through their evocation of forms of life that are arguably superior to those presented by mainstream culture. Yet, when good intentions are swept aside, the question of power remains. An analytical impulse remains implicit and undeveloped in Art Workers, as if telling the story of what artists had done during the 1960s is quite the same thing as grasping the historical lessons that the narrative has to offer. Contemporary artists continue to be interested in the question of power—cultural, economic, and political—and remain keen to understand the relations that obtain between these admittedly broad categories in the course of political action. We need to learn, for instance, how cultural power in our time has become economic power. Or how a call for economic reform in the short term may have an unintended negative political effect in the long term. The discourses of political economy, state theory, and neo-Marxist art history have yet to be integrated into the historiography of the 1960s and after. Such conversations are urgently needed as artists’ talk and practices increasingly explore alternatives to liberal capitalism and raise anew the questions of effectiveness, resistance, and social engagement. Michael Corris is a professor and the chair of the division of art, Meadows School of the Arts, Southern Methodist University. His recent publications include Ad Reinhardt (Reaktion, 2008), and Art, Word and Image: 2,000 Years of Visual/Textual Interaction (Reaktion, 2010), with John Dixon Hunt and David Lomas.